Maybe it’s already a little obvious what I think about Valkyria Chronicles 4? You’re right though, it is a title that I’m going to gush over, heaping on the praise. It’s the reasons why, and how the game makes me feel, that I truly want to get across while explaining how it’s an incredibly tactically adept strategy game and up there with the best. This isn’t to say the game has zero flaws, it does, and I will cover them. Before I get to that, though, there’s so much good to talk about. I once asked the question if I would become as attached to the cast of Valkyria Chronicles 4 as much as I did the original. At the time I said that I was leaning towards yes and I wasn’t wrong. Indeed, there are aspects here that have got me more attached to this cast of characters more than any title before it, particularly when it comes to the generally faceless people that would make up your squad in games like XCOM. There’s just something fantastically charming about the characters here. As you progress through the story you’ll be watching a myriad of little scenes, each offering a look at the different characters, watching them play off on each other and also grow. Even minor characters have moments where they’re pushed to the forefront and given time to shine. There’s actually a mission where you have to select a character for what is, effectively, a suicide run. The reaction can be heartbreaking in so many ways, either they’re putting on a brave face or showing just how scared they are. Not all scenes can be like this, of course, and a lot of them really show the juxtaposition that comes in war. You can have light-hearted moments, as well as true horror as an innocent person is strung up for even talking to their enemies. 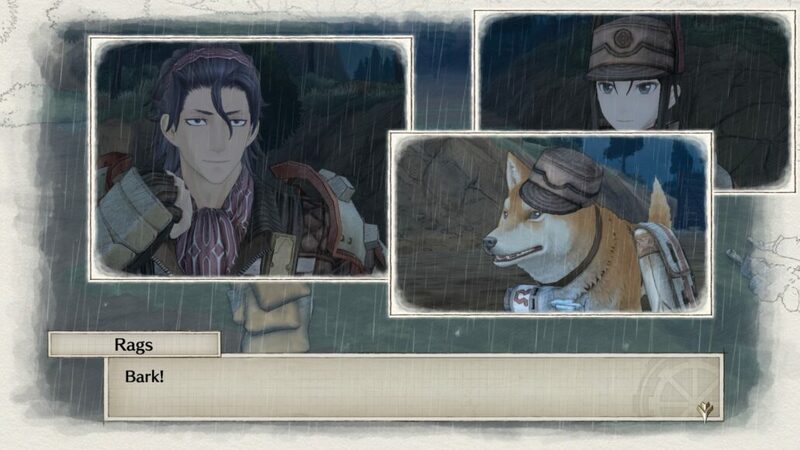 Also, because it’s animé inspired, you have a dog called Rags (Ragnarok) and he’s adorable. 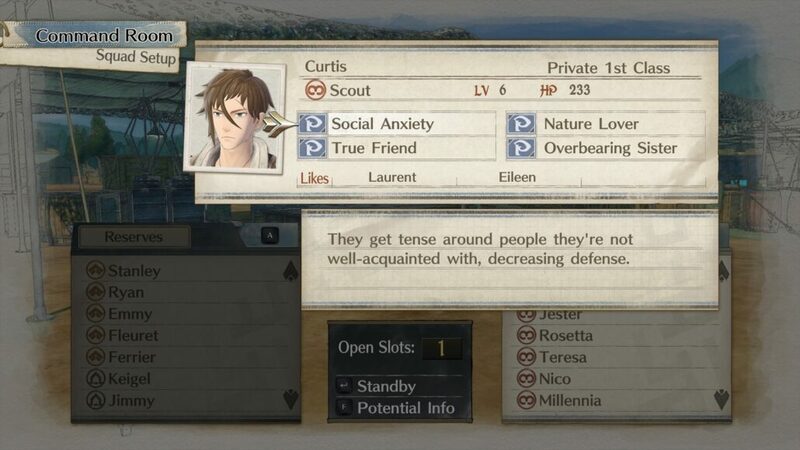 I genuinely mean it when I say one of the most powerful things that Valkyria Chronicles does is make me smile. I can be smiling at a charming moment one time, then laughing out loud at something else the next. It helps that all the characters are so well detailed and animated. Powered by the CANVAS Engine, I genuinely think Valkyria Chronicles 4 is the best looking game that you can buy right now. It’s flawless as you go through the colourful pencil-drawn and water-painted scenery. From flower-covered meadows to the white and grey snow-driven reaches in the north, it’s impossible not to love almost everything you see. Though there is an over-abundance of the less colourful and vibrant levels. That’s a huge shame too. As much as they are great to look at in their own right. Some can also be incredibly atmospheric. One example is an assault on the game’s version of the Maginot Line. It’s a brown, oppressive and overcast map, made all the more atmospheric by a constant hail of bullets from a huge distance away. What surprised me the most in that level was that these actually caused damage. It’s a constant theme within Valkyria Chronicles 4, what would have only been visual in the previous title actually has an impact now. 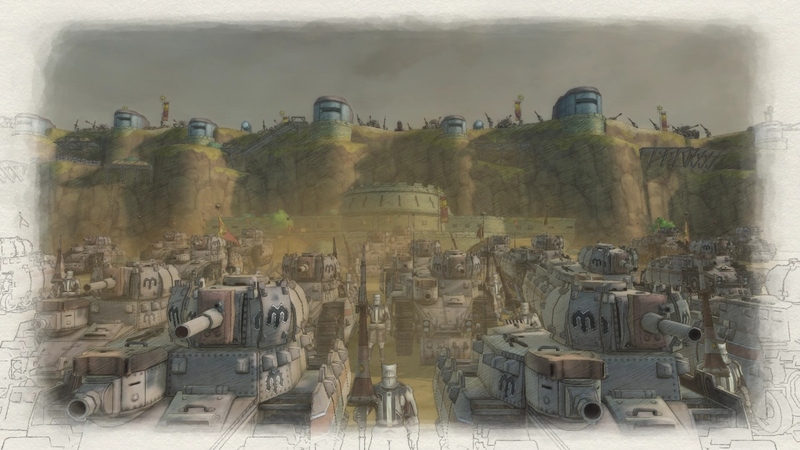 The use of weather and battlefield conditions is prevalent in Valkyria Chronicles 4. This is certainly true when fighting at night, in a snowstorm and other adverse conditions. Sometimes it’s something as simple as your view distance being lowered, whereas other times you’ll find that you can use the environment to your advantage. Trigger an avalanche that falls on enemy units for a quick and easy few kills, though be sure to move your own people out of the way too otherwise you may find yourself praying for a medic. As with the first Valkyria Chronicles, once a member of your force has been reduced to zero health, you have three turns to get to them. 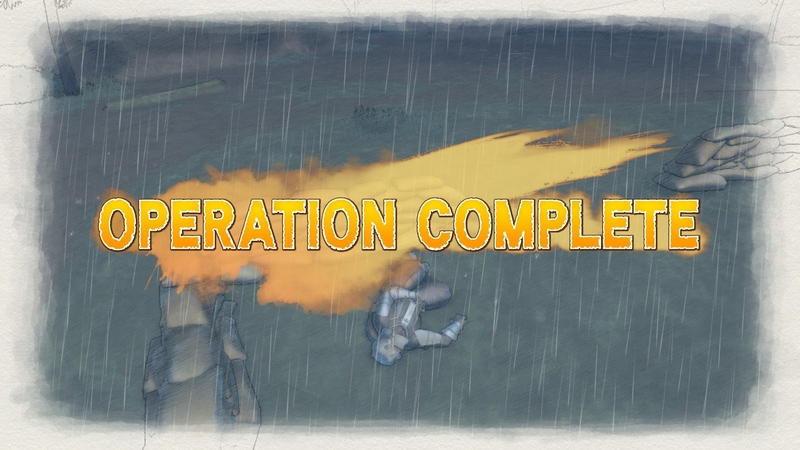 This lets you evacuate them from the battlefield, letting them fight another day. However, if you don’t make it in those three turns, or if an enemy happens to get to the unit, they’re killed in action and gone for good. It’s surprising how much of an impact this has because each character has their own personality as well as unique traits. Some of these traits can be quite strange and even contradictory. Two characters on your roster of units are brother and sister. Starting them in battle together will both see positive and negative effects, as will starting with just the sister. Starting with the brother and later bringing in the sister as reinforcements, with them fighting under the perfect conditions, can see a great boost to their combat abilities. This is very much a continuation of the first game of the series, as is the rest of the combat. Your turn is divided up into a series of action points – with the addition of a command point. With each action point, you take the direct control of a unit, move them to where you want to move them, performing actions along the way. Certain actions do not prevent you from performing more, so, for example, an engineer can disarm as many mines in their turn as possible, but can only attack or heal that one time. That is unless you use another action point on them, but their range is diminished even further. It can be a sound tactical move, however, to use multiple actions on one character to effectively pierce the enemy lines. However, it’s wise to be careful as while you are moving, the enemy is free to fire at you when you enter their line of sight. As soon as you start aiming to fire your weapon, though, they will not fire at you except to return fire. There are a few core changes to the main gameplay that are worth noting. Note, this comparison is to the first title, not the second, third or revolution spinoff. One of these changes, however, comes right from the second and third sequels. This is an APC. You are able to now field an APC, once it is unlocked in the story, which allows for a lot more flexibility in getting units towards the front line. Another brand new unit is the grenadier. This joins the sniper as your only long-ranged infantry, with the grenadier acting as a perfect way to destroy enemy cover and fortifications. Maps that contain enemy fortifications like pillboxes, anti-tank and anti-personal mounted guns, which are all stationary, make perfect targets for your grenadiers if you can place them somewhere safe while keeping these placements visible to another unit. When you’re in the middle of a heated battle, using units to their best, Valkyria Chronicles 4 can feel right up there as one of the best tactical games around today. However, there are moments when this is ruined. What doesn’t ruin it, but undermines it, is the use of ranking solely based on your speed at completing a mission. Getting a high rank should be more nuanced than a speed run but based on keeping damage received low and other aspects. Another issue is the use of, frankly, stupidly unfair mission elements and bosses. I can understand completely the use of set moments in battle, like the bringing in of reinforcements for the enemy, which you have to then work around. It makes sense and gives you something to think about. However, some of these can be almost insurmountable. Enemies will be picking you off out of nowhere, on both yours and their turns. Others, like certain bosses, can be incredibly finicky to take out, requiring unfair levels of precision and also making it near-impossible not to lose a unit. 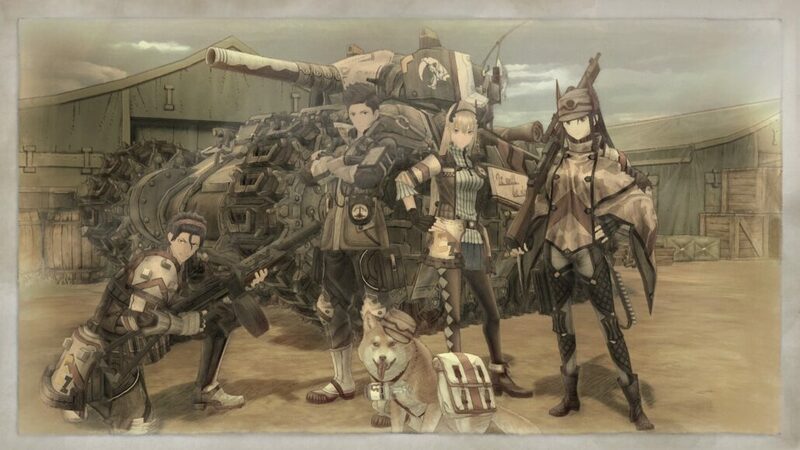 It’s impossible to argue that Valkyria Chronicles 4 actually does a great deal new. It doesn’t, but nor can I say that the game should have done much different from the original. Certain elements have been refined to a near-diamond shine, though sadly some of the blemishes still exist. I would say that the story and characterisation is better than ever before, with even the battlefield action being improved thanks to the inclusion of new units and actions. In addition to this, the AI of the enemy has been improved, meaning that they will actually try to flank you, aim to capture areas before aiming for a kill and bringing in units when they can. However, this isn’t perfect, with them seemingly only focusing on bringing in reinforcements at their most forward base. One other issue that it retains is actually something that I didn’t find irritating in the first game, though it didn’t seem to be as egregious back then. As you go through the story, modelled around the diary of Claude Wallace, you select one scene. You watch that scene, which could be anything from 30 seconds to even five minutes. You’ll drop out of that to the menu, only to then unlock another one or two scenes that again feature a few lines of spoken dialogue and a lot of text. There’s just too much dropping back to the menu when it’s simply not necessary. The only other minor issue for me would be the UI when it comes to roster changing, unit upgrading and levelling up in the headquarters. 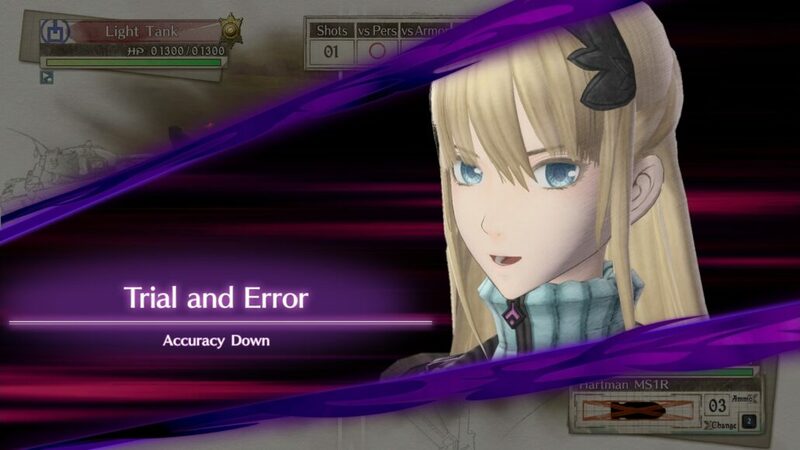 Valkyria Chronicles seems to think something along the lines of “Why click just three buttons when I can force you to click six?” and by god does it make you. It’s just another small niggle in what is an otherwise fantastic game. Were SEGA to have fixed the focus on speed runs and helped create a little more balance in the story, as well as balancing the later levels, I could imagine Valkyria Chronicles 4 being up there as one of my joint best-rated games ever with Civilization VI, Horizon: Zero Dawn and Total War: Warhammer II. It may have even been my first 10/10. This isn’t to say it’s off by much as it currently stands as my top game of 2018. It’s a game that I genuinely think anybody and everybody should buy, there’s no real reason not to either, as it’s on the PC and all three consoles. On occasion, the storytelling can drag on or become irritating as you have to drop back to the menu just to watch another scene.